Gemini IV orbited the Earth on June 3-7, 1965. While James A. McDivitt remained inside, Edward H. White II opened the right-hand hatch and floated out into space, where he remained for 20 minutes, the first American astronaut to "walk" in space. Three months earlier, Soviet cosmonaut Aleksei A. Leonov had performed the first spacewalk. White was connected to the spacecraft's life-support and communications systems by a gold-covered "umbilical cord," and he used a hand-held jet thruster to maneuver in space. The Gemini missions tested procedures and equipment needed for upcoming Apollo missions to the Moon. 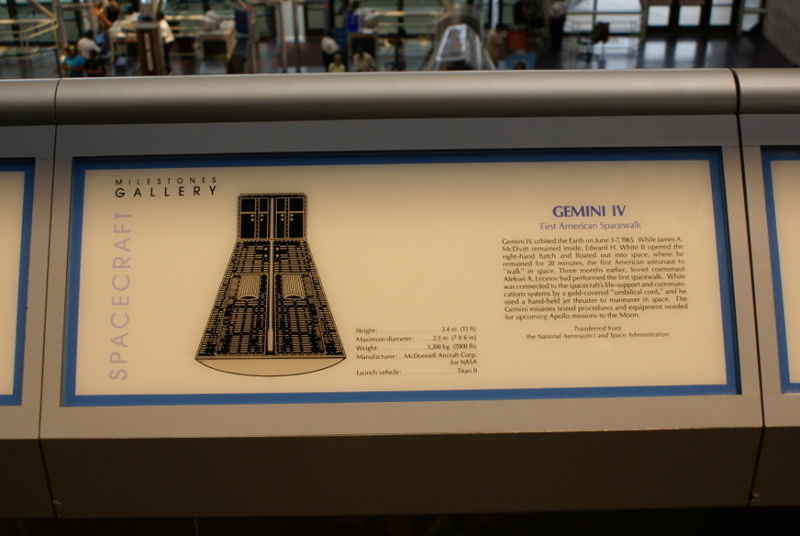 Gemini 4 is NASM catalog #A19670209000.